Two astronauts, Greg Harbaugh and Mario Runco, emerge from the airlock in their space suits after a 1993 EVA, with the assistance of Mission Specialist Susan Helms. 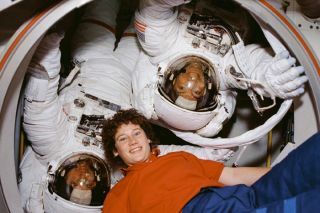 In this historical photo from the U.S. space agency, STS-54 Mission Specialist Greg Harbaugh (red stripe) and Mission Specialist Mario Runco, both wearing their space suits, pose with Mission Specialist Susan Helms as they emerge from the mid-deck airlock with Helms' assistance. Harbaugh and Runco returned from a series of EVA tasks designed to increase NASA's knowledge of working in space. They tested their abilities to move about freely in the cargo bay, climb into foot restraints without using their hands, and to carry large objects in microgravity.